Robberies on police beats 1923, 1924, and 1925, have fallen to a record low. 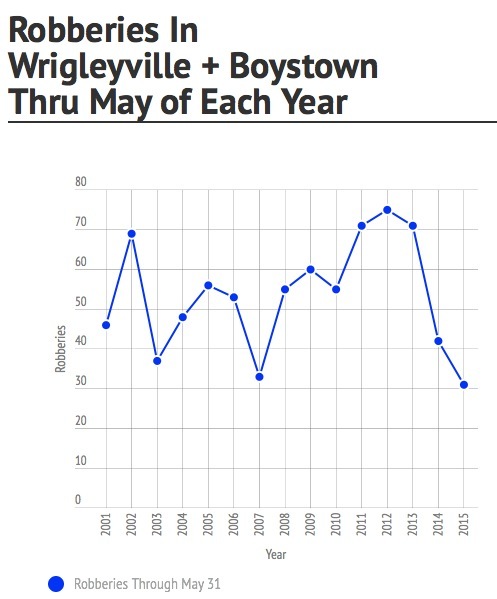 Wrigleyville and Boystown's robbery rate, which became the worst in Chicago as it recorded three consecutive record-high years between 2011 and 2013, is continuing to drop after community pressure forced Chicago police to address the problem in 2014. The three police beats that comprise most of Wrigleyville and Boystown recorded 31 robberies this year through May. That is the lowest robbery count on record since at least 2001, the first year for which crime statistics are available to the public. CWB documented only three bona fide reports of robbery in May that were not memorialized with a police report. All three cases went unrecorded because victims refused to file complaints. By comparison, we tracked seven unrecorded muggings in May 2013. Three cases went unrecorded because victims left the scene after enduring extended waits for police responses. The other four were not recorded because the victims refused to file complaints. Instances of extended responses to robbery-in-progress and robbery-just-occurred calls have dropped to near zero since recently-departed 19th District Police Commander Elias Voulgaris replenished the ranks of our district's depleted overnight police force and targeted the officers' efforts on local robberies last year. While excellent police work, community pressure, and a little truth-telling have paid big dividends in our immediate neighborhood, areas immediately south of Belmont and the Uptown neighborhood have seen significant increases in robberies. In Uptown, police beat 1913 covers the area due north of Graceland Cemetery. It has seen a 225% increase in robberies, recording 13 cases so far this year compared to just four at the same time in 2013. Closer to home, beat 1933—the area from Belmont to Diversey and Halsted to Lincoln—has seen a 150% increase in robberies compared to last year. Among the 10 cases there this year is the cell phone robbery that turned into the murder of local resident Kevin O'Malley on May 30th. Compared to the record-setting year 2013, though, robberies on beat 1933 are down 54% year-to-date. Note: For statistical purposes, CWB considers the area of Chicago Police Department beats 1923, 1924, and 1925—including all crimes on the outside border streets of Irving Park, Southport, and Belmont—to be "Wrigleyville and Boystown."